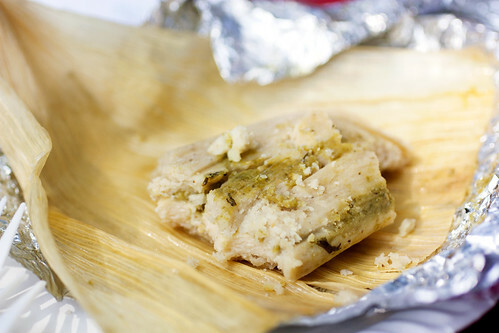 Years ago, when the Red Hook Ball Fields was still flying under the DOH radar, and mom and pop Latin food stands were still prevalent, I remember having the most amazing meal of tacos and horchata. 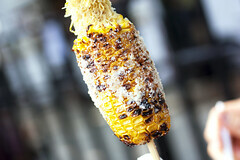 Now, all the food is in trucks, and while the spirit is different, great food still abounds. On my last visit, I first started off with a pupusa platter ($6) from El Olomega, coincidentally, the winner of this year’s Vendy Awards. 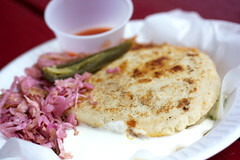 A platter is any combination of two pupusas. I ordered one chorizo and cheese for myself and one zucchini and cheese for David. Pickled jalapenos, curtido, and salsa was self-serve. Although the tortillas were a bit too loose, they were fresh with a good amount of filling. 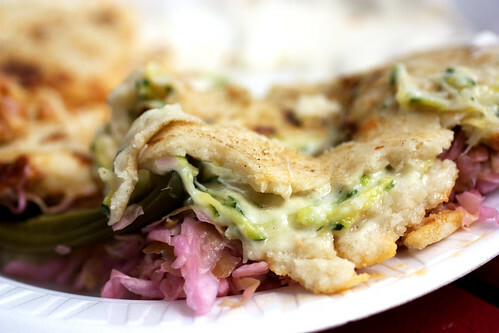 When it comes to pupusas, freshly made pupusas trump pre-made ones any day. Pupusas were also an option at the Solber Pupusas Truck (winner of the 2011 Vendy Awards), but I wanted a tamal and ordered a chicken tamal with sour cream ($2.50). 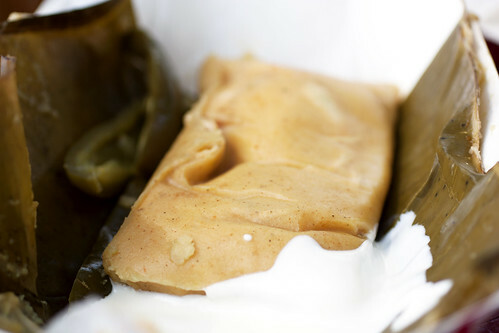 If you’ve never had a Salvadoran tamal, it’s similar to softer Yucatecan-style tamales wrapped in banana leaves but filled with more stuff, like vegetables, chickpeas, and sometimes even raisins. In burger terminology, it’s like a meatloaf as opposed to a burger. (Cornloaf?) Solber Pupusa’s rendition was solid, and while the filling was generic and probably from a bag of frozen mixed vegetables, I loved the moistness of the masa. Personally, I prefer Mexican tamales, but unfortunately, the chicken tamal ($2) one truck over was dry and hard. The elote ($3) from a truck a few more trucks over wasn’t much better. It was also dry and barely slathered with any mayonnaise. Tacos next time for me if I want Mexican, in addition to a few pupusas. If you want to try either yourself, get thee quickly to Red Hook! The trucks are moving on in October.